- VRAC is asking their next game against UBU-Colina Clinic to be postponed since it clashes with Georgia v Spain and up to five players from their club have been called to national team. But FER has been reluctant to accept this in recent times since schedule is extremely tight. So we're in for another Valladolid v FER battle. Alvar Gimeno and Igor Genua are out due to injuries, Mauri Londoño and Diego García are in. Now we are really f**** in backs. I have to take the clubs side on this one, if the 6 N are doing the same why can FER sort their schedule out? FER made a proposal last Summer to shorten the league that clubs didn't even want to study. It implied a regular season round robin of 11 weeks and then two pools dividing teams based on performance, like it is done in the Netherlands. We've got 22 weeks of regular season, 3 weeks of playoffs, 2 weeks for Cup, 1 week for Supercup and 1 week for Iberian Cup: 29 weeks of club rugby. And then you have to find space for 7 or 8 weeks of international rugby. There will always be at the very least three or four clashes because nobody wants to play in Christmas or Holy Week and league must finish in May. So no different from England Rugby, Do the competitions have a week off? or a weekend break during the regular season? Last weekend all lower level tier Rugby had a weekend off the Pro's the last 2 weekends. is that possible to arrange? Spain doesn't play in Europe so why is it hard to arrange? Fron 16 September to 26 May club rugby has only 8 weekends off: 18 November (test match), 6 January (bank holiday), 10 February (REC), 3 March (REC), 10 March (REC), 17 March (REC), 21 April (bank holiday) and 19 May (to prepare the final). We need to change the format of the league (less revenue), start earlier (more costs) or reduce the number of teams (nobody wants that). 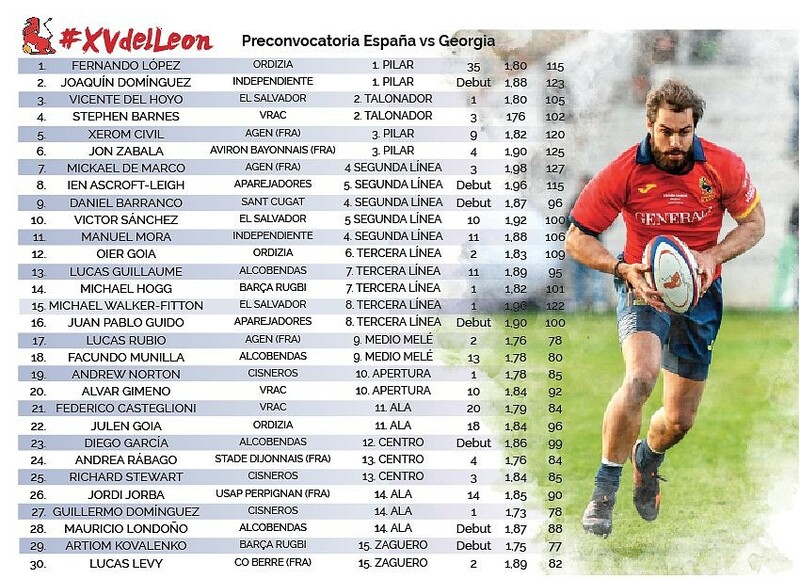 In a nutshell what is the new Spain 7's series currently being promoted by Feijoo? A desperate attempt at having real competitive (not party) Sevens in Spain so to detect players for the national team. Spanish 7s Championship has been held over a single weekend the few last years and only six or eight teams entered. Here they are trying to give it a better packaging and a little more length (two rounds) following the example of women's series. But women have financial support from Iberdrola. So it's a big doubt whether it's gonna work. 3 Spanish players in Agen? That’s cool. Colombia’s only player is there so good to see some other Spanish folk. To be honest, only Xerom Civil is Spanish-born and anyway his mother is French and he moved to France aged 12 or 13. Lucas Rubio and Mickaël de Marco are eligible through ancestry. Most of them will be back later in the tournament, some just to say goodbye and retire from international rugby in front of Madrid crowd. And that will be the case for both French and Spanish-born players with pro contracts. Gautier Gibouin is a big question mark because he is risking his professional future in Nevers, he wants to come, he was part of the first squad released to play against Russia, but FER and him won't take any risks this year: if his club needs him, he will not play for us. Really? He could be in trouble for wanting to represent his country (of "adoption" but still)? I've read similar things in the past year and thougth about them as nothing else but rumors, but if one of the captains is actually under that pressure, I guess those rumors are then pretty accurate. And the worst part is I don't think there's much the player can do about that other than play his cards wisely. All in all, I hope to see him and the others once again in the pitch, even if its only to bid them farewell. Welcome to the dark side of international rugby outside top teams. Every time there is Rugby World Cup we see players from Tier 2 or Tier 3 declining to take part with their countries because their clubs ask them to. Just a couple of weeks ago both Montpellier Fijian wingers announced their international retirements after signing new contracts. As long as FER hasn't got enough money to compensate clubs or contract players we must adapt to the needs of players and clubs. And that's why we've got a guy like Jean-Michel Aguirre contracted by the union. Since he's a French rugby legend of Spanish origin, he's totally in love of the game (I sat next to him at Central stadium once and he really 'feels' it) and he's respected by coaches and presidents of French clubs, he manages to broker small deals with then so players come and go as they need. Sometimes our players don't even take part in post-match celebrations and they've got a car waiting for them so they are back home when promised to their teams. HOYO = oio | odjo? GUIDO = gido | gvido? MUNILLA = munilia | munidja? JULEN = khulen | zhulen ? JORDI JORBA = kh | zh ? GUILLERMO = giiermo | giliermo | gidjermo ? Nice. Is it possible to listen to it somewhere? There is a small mistake, in División de Honor B there are 36 teams. They claim it's part of an effort from the club to give its amateur sections more visibility and a reward for reaching Copa del Rey final. You say they claim this, what do you think are their ulterior motives? And to clarify, they will be touring Japan in July 2019, not 2020. I always get confused when someone says "next" instead of "this" - interchangeable terms for dates that people don't seem to agree upon. It's weird, if you said next summer in September or October I'd know exactly what you mean but if you say next summer in March/April I'd think it was the following year. Don't know if this happens to anyone else.